National and provincial health departments are failing dismally when it comes to meeting the minimum standards required of them by the Constitution, lacking precise plans to give effect to policy and legisl ation. They are also treacle-slow in passing laws vital to help them contain virulent diseases such as multidrugresistant tuberculosis (MDR TB). This was said by Dr Adila Hassim, co-founder of and head of litigation and legal services for Section 27, the eponymously named NGO that has been at the forefront of groundbreaking court actions forcing government to speed up vital treatment access for well over a decade. Speaking at the closing plenary of the 4th National TB Conference in Durban in June, Advocate Hassim said that with 148 people dying of TB every day and MDR TB increasing from 7 350 notified cases in 2007 to 14 161 in 2012, there were now simply too many patients awaiting treatment after diagnosis, and not enough beds available. This was an undeniable public health emergency - which could be mitigated by the simple dint of using available constitutional remedies that spelt out the minimum duties of government. 'When it comes to TB, almost every single provision [of the Constitution] is implicated in one way or another; these are not just rights, but duties and structures of our government. As lawyers we see what is going wrong in our system,' she added. affordable medicines, and prisons and the rights of prisoners. The Constitution spelt out certain minimum standards for policies aimed at achieving progressive access to healthcare for all - and made officials accountable to the public. Legislation and policy, while necessary, were insufficient. What was needed were precise plans and implementation, with monitoring, budgets, resources and knowledge provided to every facility and healthcare worker. These had to be evidence based, reasonable and flexible. 'All of this comes out of case law from the Constitutional Court - they are not good-to-have, these are factors that the courts said they'll take into account when they scrutinise policies!' she emphasised. 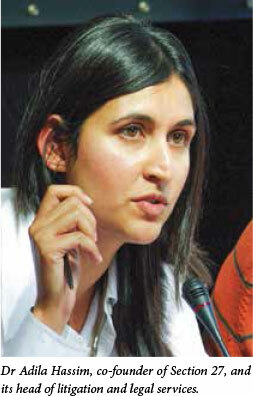 Citing the 2008 'Goliath' case in which four extensively drug-resistant (XDR) TB patients who ran away from the Brooklyn Chest Hospital in Cape Town legally contested their compulsory readmission and continued isolation (and lost), Hassim said individual rights could be limited 'when reasonable and justifiable'. Judge Bennie Griesel, with Judge James Yekiso concurring, ordered that Goliath and his fellow patients be forcefully readmitted if necessary, and isolated at Brooklyn Chest Hospital for a period of three consecutive months or until they had fulfilled the criteria for negative sputum culture conversion for XDR TB. Judge Griesel pointedly noted that the regulations on communicable diseases were in draft form - a situation that persists today, six years later. Hassim said these regulations were 'not perfect, but they're bloody good - and deal with a lot of questions being asked, such as what do you do when a patient diagnosed with DR [drug-resistant] TB insists on returning to work - these regulations would help us respond'. The draft regulations set up a communicable diseases advisory board of health professionals from every level of government, the private sector and academia, reporting directly to the National Director-General of Health. They also restated the duties of all national and provincial health departments and their operational chiefs, setting the bar for infection control and the maintenance of infection control equipment. They provided clarity on where and when a court order could forcibly isolate a patient. She was aware of at least four cases besides the much-cited Goliath matter where the courts had also instructed police to 'go and arrest people in communities'. Hassim called upon the National Department of Health (NDoH) to promulgate the regulations on communicable diseases as a matter of urgency, in order to support the national leadership and the decentralisation of TB management, which had vastly improved since the contentious XDR infection court cases were heard. When it came to affordable medicines, everyone was 'familiar' with the Treatment Action Campaign (TAC)'s nevirapine and antiretroviral roll-out court victories over the Mbeki government, but the focus had now turned to similarly unavailable lifesaving DR TB drugs. Hassim said the response of Discovery Health Medical Scheme to the TAC's appeals to pay for a DR TB patient's expensive but lifesaving linezolid drug treatment was that he could only be treated by government within the public healthcare sector. 'They said they were obliged by Prescribed Minimum Benefit legislation to fund for diagnostic and initial treatment, but thereafter would refer him to the public sector.' Linezolid cost R715 per 600 mg tablet in the private sector (R282 for the same tablet in the public sector), while a generic version cost R88, she said, alluding to what was then a Médecins Sans Frontières (MSF) pending application to the Medicines Control Council (MCC) for controlled access to the generic version (ultimately successful). Linezolid was policy-approved by both the World Health Organization and the NDoH. MSF had anticipated that the MCC would take into account the right of access to health services in making its decision, given that exceptional circumstances existed and that there would be certain mortality and morbidity without linezolid or its generic equivalent. In spite of the long delay, the MCC had finally, and to everyone's great relief, 'had a change of heart', allowing MSF compassionate use of the Indian-manufactured generic Hetero in its clinics from early July.